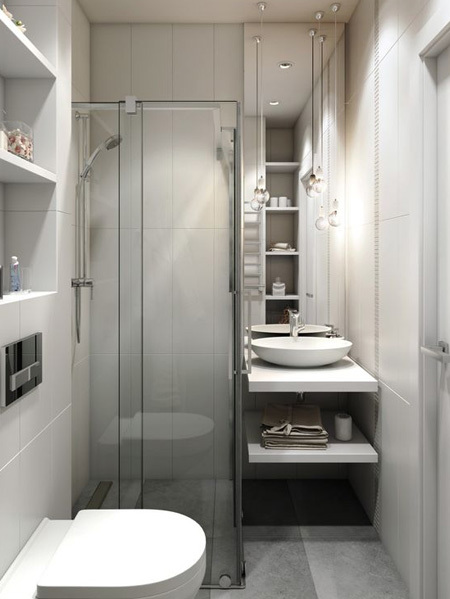 If your bathroom is cramped and cluttered, we offer some tips of turning it into a functional space that looks larger than it is. Despite what glamorous bathrooms look like on the TV and in magazines, the reality is that not every home has a bathroom that is large enough for a jacuzzi-size tub or for luxurious fittings and fixtures. For many of us, we have a small bathroom that doesn't even have room for an extra towel rail, never mind a separate shower. If this is your life, we offer some tips to creating a space that is functional and good looking. Nothing beats the power of white to make a small space feel roomy. White has the ability to make even the smallest room feel larger than it is. 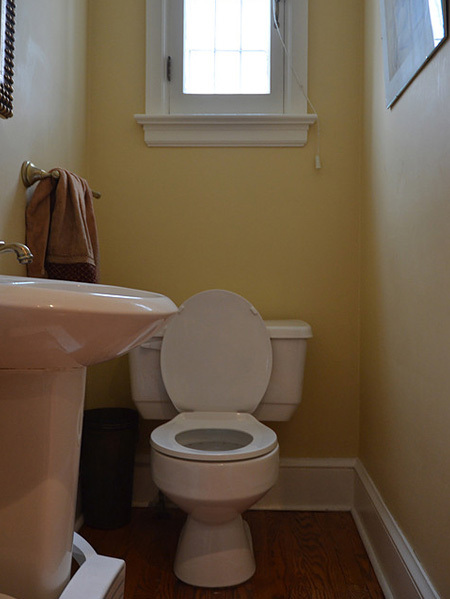 If your bathroom is dark due to lack of natural light, white instantly refreshes and lightens up. Combining white with subtle neutral colours means that you don't have to settle for an all-white bathroom, and it's easy to add bold splashes of colour with accessories and textiles. 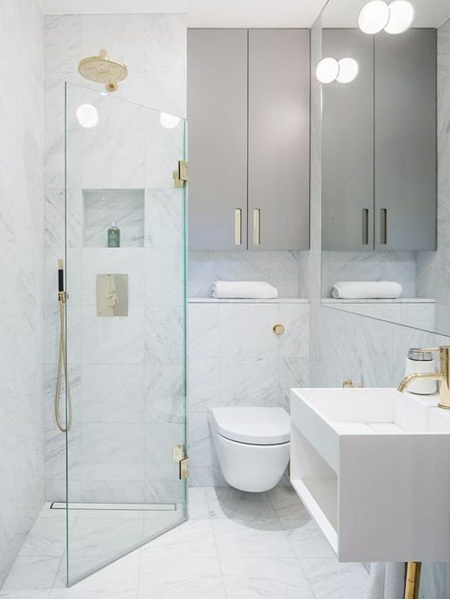 This average-sized guest bathroom is what many of us have to put up with, but you can still make cosmetic changes to make the setting look more glamorous. 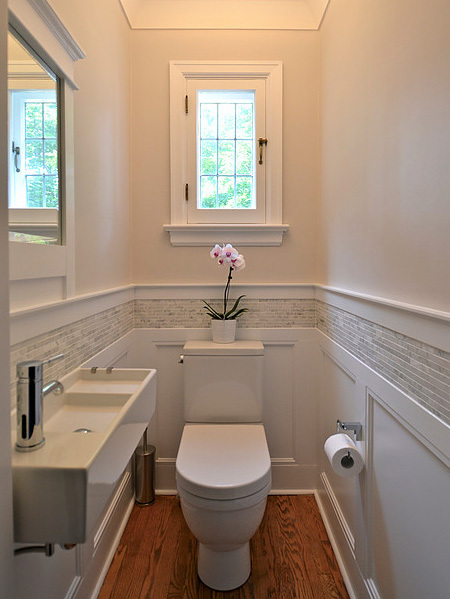 Think all-white for ceiling, walls and trim and then bring in some interesting texture and pattern with a mosaic or glass tile border that spans around the room. Minimal pattern in the room will also go a long way towards visually enlarging the space. If you prefer to tile walls, use large-format tiles instead of small tiles. If you can afford to install new sanitary fittings, shop for compact models. A slimline hand basin on one wall takes up far less space than older, more traditional pedestal sinks. And because these sinks are wall-mounted, it opens up the floor and makes the room feel less cramped. The same applies to the toilet and cistern. Older models tend to be bulky and can easily be replaced with a newer version that takes up far less space. 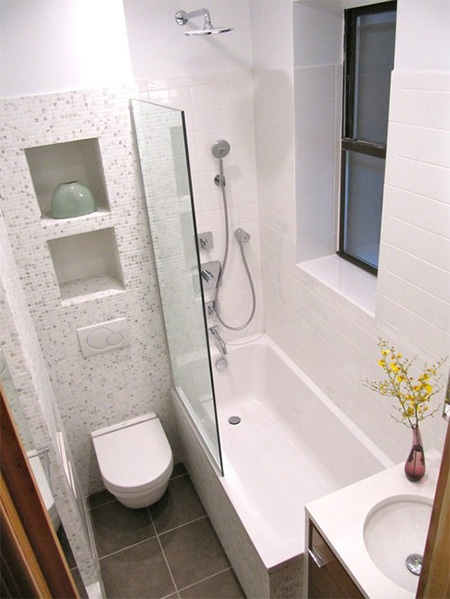 In a bathroom that's on the small side it is better to keep fussy details to a minimum. Too much clutter on counters and hangers will only make a bathroom feel smaller, so it's better to keep all your clutter out of sight behind closed doors. Install storage that is designed to take up as little space as possible, and look cabinets and cupboard that can be fitted to take advantage of open wall space or unused floor space. Shower curtains can block out a lot of natural light, and in a small bathroom you want as much natural light as possible. Replace a shower curtain with a seamless glass door or glass panel to allow light to flow through the space and the room will feel much better for it. Shop for cabinets and cupboards that don't take a lot of floor space. Streamline fittings can work just as well and won't take up too much of your valuable floor space. If you can't find what you need, use floating shelves or make your own shelves to fit into the room. And don't forget that you can use corners as well! 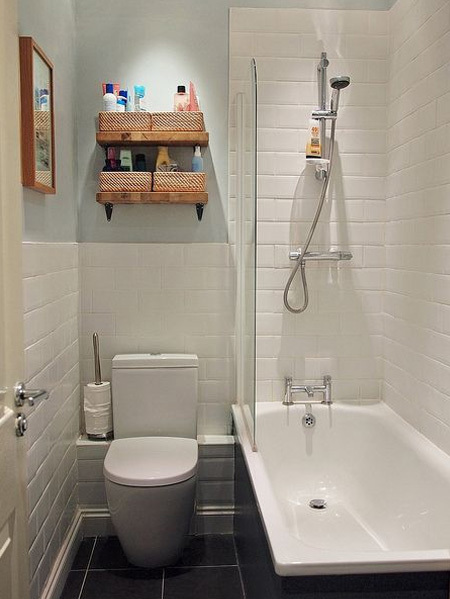 The right amount of lighting is essential for a small bathroom. A tiny bathroom that only has a single, central light fitting will look far less inviting than a bathroom filled with natural and artificial lighting. It doesn't cost much to have an electrician come in and add a couple of downlights, and this will make a huge difference in how the room looks and feels.